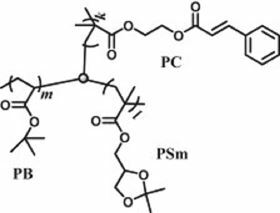 Two functional mikto-arm star terpolymers μ-(PB)(PSm)(PC) were prepared, where PB, PC, and PSm denote poly(tert-butyl acrylate), poly[2-(cinnamoyloxy)ethyl methacrylate], and poly(solketal methacrylate), respectively. To prepare the samples, two PB-b-PCOOH-b-PSm triblock copolymers containing a carboxyl-bearing PCOOH block of 5 units and a PNH2-b-PC diblock copolymer incorporating an amino-bearing PNH2 block of 5 units were first prepared. The PCOOH and PNH2 blocks were then associated in solution, bringing together a triblock copolymer chain and a diblock copolymer chain. Functional μ-(PB)(PSm)(PC) copolymers were obtained from amidation of the associated PCOOH and PNH2 blocks. The effect of varying the reactant concentration on the yield and selectivity of μ-(PB)(PSm)(PC) synthesis was examined. Further, we developed fractional precipitation protocols for purifying the crude reacted mixtures to yield essentially pure μ-(PB)(PSm)(PC) samples. This paper was originally published in Materials Today Communications, 1-2 (2014), Pages 9-18.